Coach Eastman enters his nineteenth season as the Head Baseball Coach of The Woodlands High School and is the winningest Head Coach in Highlander history with a record of 416-145 and 13 district championships. Eastman’s overall record in 26 years as a head coach is 572-255. In 2013, the Highlanders won their 3rd state title and he was named the National High School Coach of the Year for the third time. Last year, Coach Eastman lead the Highlanders to a Semifinalist finish in the 6A State Tournament. As selected by his peers, in 2017, Coach Eastman was inducted into the National High School Baseball Coaches Association Hall of Fame in December in Tucson, AZ. 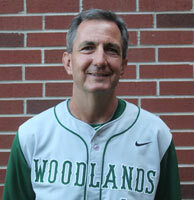 Coach Graves has been a coach in The Woodlands Highlander baseball program for twenty two years. He is a graduate of Nacogdoches High School where he played football and baseball. Coach Graves played college baseball at Stephen F. Austin State University and is a 1995 graduate of Texas A&M University. He was a proud member of the 2000 Texas 5A State Championship coaching staff. Coach Graves has served as the pitching coach for the Highlanders for fifteen years including the 2006 State Championship and 2013 State Championship teams. He also serves as the campus athletic coordinator and head football coach for The Woodlands Ninth Grade Campus. He and his wife Dina have two daughters, Peyton, Rylie and son Bryce. Coach Chris Harden enters his eighteenth year as Assistant Coach for The Woodlands Highlander Varsity team. He is a 1988 graduate of Cheboygan High School, Cheboygan, MI, where he played Varsity baseball, football and basketball. He attended Ferris State University in Big Rapids, MI where he earned his Bachelors in Math Education in 1997. At Ferris State, he was a four-year Varsity baseball player. In 1993, he was named the MVP for the Ferris State University Baseball Team and in the same season made Great Lakes Intercollegiate Athletic Conference 1st Team All-Conference. Coach Harden is currently a Math teacher at TWHS. This is his twentieth year of teaching and the last eighteen years has been with CISD. He is a newlywed to his wife Ashlee and is father to twenty-year-old twin sons, Jarrod & Jordan. He is the son of Richard & Lucy. Coach Dayne Mitchell enters his sixteenth year coaching baseball overall and 4th in the high school ranks. He will serve as the JV Head Coach for the Highlanders and assist Varsity throughout the year. He played Varsity Baseball and Basketball at Westwood HS in Austin where he graduated from in 2003. He hit leadoff for the Warriors while getting the Honorable Mention Award his senior year. In basketball, he led Central Texas in free-throw shooting percentage at 88.7% and was named to the Second team. He is married to his wife of three years, Kandace Mitchell, who teaches 7th grade Science at Irons MS and they have two dogs, Skye Mitch and Poki. Coach Hays will be entering his sixth year as coach for the sophomore team at TWHS, where he also coaches Freshman football. Prior to this, he coached football and basketball at McCullough Junior High. Coach Hays is a graduate of Peoria High School in Arizona and Texas A&M University (Class of 2006). His wife, Heather Hays, is also a teacher at TWHS and they have a daughter, Harper. Coach Chad Rozelle is in his twenty-second year of teaching & coaching and his nineteenth year with The Highlander Baseball Program assisting at all levels as a volunteer. Coach Rozelle teaches a high school credit Health class at McCullough Jr. High as well as coaching seventh and eighth grade football. Prior to McCullough he served as the Junior Varsity Baseball coach at College Park High School from 2005-2008 and from 1998-2005 coached The Woodlands Sophomore Baseball team for seven years. Coach Rozelle is a 1996 graduate of Texas A&M. Coach Jeff Lilley is entering his 12th year as an assistant for the Sophomore team. He currently teaches at McCullough Junior High. Coach Lilley is a graduate of the University of Southwestern Louisiana (now Louisiana-Lafayette). He coached baseball for two years in Louisiana, one as an Assistant Coach at Merryville High School and one as the Head Coach at Oberlin High School before moving to Texas as an Assistant Coach then Head Coach at Hull-Daisetta High School. After five years at Hull-Daisetta, Coach Lilley moved to Cypress where he currently resides with his wife Katrina and their son Carter.